Mougoué was born in Cameroon (her parents are from Kékem and Bafang) but spent much of her childhood and young adulthood in the Midwest, including Michigan, Ohio, Illinois, Minnesota, and Indiana. She also, almost literally, grew up on university campuses. Her father is a university finance professor; Mougoué grew up sitting at the back of classrooms listening to lectures on the stock market when there were no babysitters available (she still can’t claim to know anything about the stock market though!). Mougoué is the eldest of very tall brothers; she frequently reminds her younger brothers about her powerful firstborn status. Mougoué is currently working on two projects. The first is a book project provisionally titled, Manhood, Religion and Transcontinental Networks in Africa. The second project will be a graphic novel on the Anlu Rebellion that will visually examine how Kom women in western Cameroon disturbed local political power and protested against British rule in the Southern Cameroons from 1958 to 1961 (the women won). This second (artistic) project reflects Mougoué’s lifelong passion for drawing and painting. . . which her father quickly shot down when she told him she wanted to be an art major in college. “I will not pay for you to draw. I will, however, pay for you to go to medical school and become a medical doctor,” he told her. So, Mougoué switched to being a history major; she avoided all paths leading to a medical career. Mougoué’s hobbies include long-distance running (her favorite runs were on Mount Cameroon and in Hawaii, the big island), traveling, photography, painting, and writing poetry and short stories. Also, Mougoué gives talks at women’s prisons on self-esteem, identity and overcoming varied forms of (physical) abuse. Mougoué taught History of Modern Africa, Women and Gender in Modern Africa, and World History at Baylor University from 2013 to 2019. This fall, she will be starting a new position as Assistant Professor of Gender and Sexuality in African Cultural Studies at the University of Wisconsin-Madison. 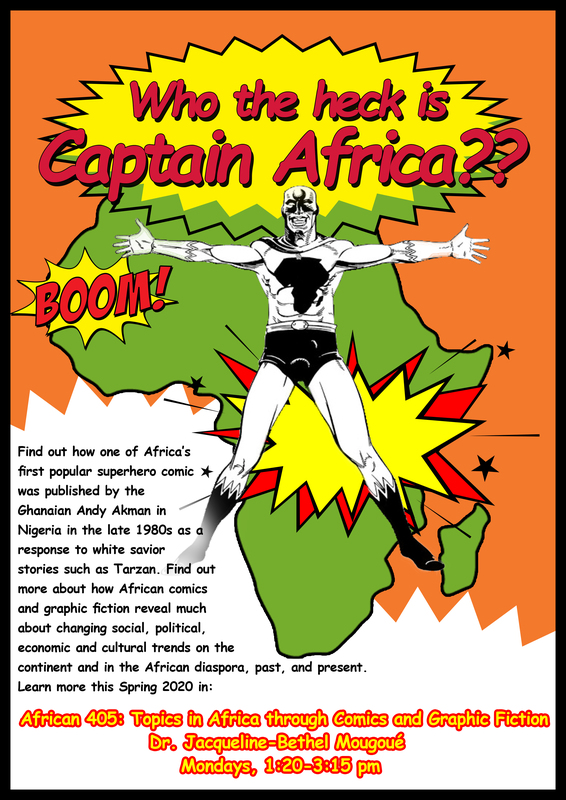 She will be teaching Introduction to African Popular Culture and two courses she proposed: 1) Gender and Sexuality in Afrofuturism and 2) Africa through Comics and Graphic Fiction.